POSTED BY: info265 | Fri Mar 27th, 2015 2:15 p.m.
A.I.R. Gallery is pleased to present One, Six, Twelve, Twenty , an exhibition of new paintings by artist Ann Schaumburger. The exhibition will be on view in Gallery I from April 2 – April 26, 2015, with an opening reception to be held as part of DUMBO’s First Thursday Gallery Walk, Thursday April 2, 6–9 pm. The title of Ann Schaumburger’s exhibition One, Six, Twelve, Twenty derives from the number of times she repeats a house motif in a single painting. These works, created on linen, canvas, and wooden panels using unmixed Flashe pigments, vary in size from 9” X 12” to 40” X 48”. Through variation in scale and color, the artist explores the syncopation that can be created by physical juxtaposition and color harmony. Schaumburger has been experimenting with a simplified, geometric house motif for several years. 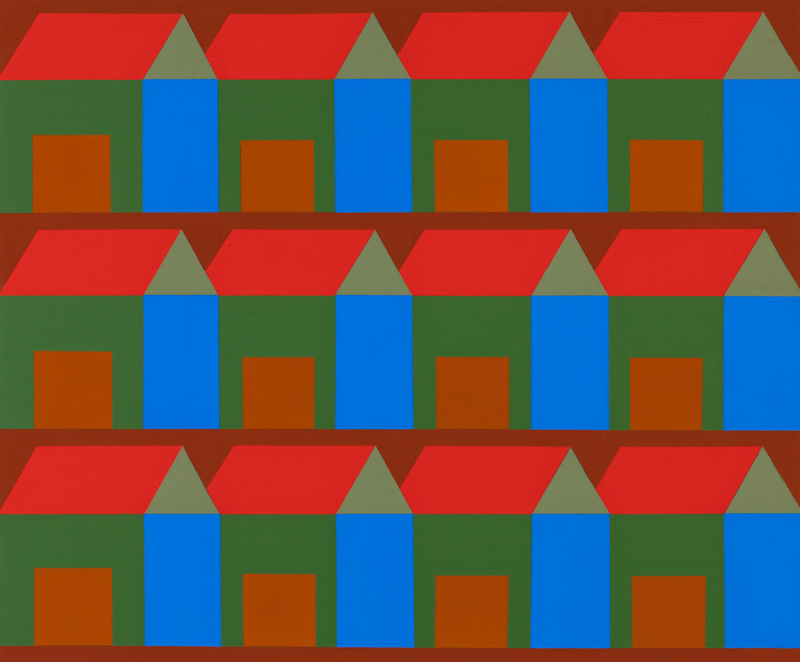 One, Six, Twelve, Twenty is the first time the artist uses as many multiples of the house in a single work of art. For Schaumburger it is a pleasure and a delight seeing what happens at edges when color is put together. Unexpected color relationships ultimately trigger forgotten memories. Working with color in a meditative way links her past to her present, and provides an architecture for artistic process. Schaumburger is a color virtuoso. Her extraordinarily varied and sophisticated palette, and the vibrations she encourages between sets of colors, seduce the viewer into a sublime comfort, alluded to by the house. There is a subtly keyed aliveness as well, thoroughly supported by the predictability in the paintings’ design. fthh Avenue N, R, and Q subway station for the New York City Metropolitan Transportation Authority’s Arts for Transit program.